The Maroons have another chance at a statement win (or two) this Sunday when they travel to face Illinois Wesleyan, ranked 22nd nationally, in a doubleheader. The line between good—a 20-win season, say—and great—an NCAA bid, perhaps?—is often a single, signature victory against quality competition.The Maroons, who have already beaten two ranked opponents this season, have another chance at a statement win (or two) this Sunday when they travel to face Illinois Wesleyan, ranked 22nd nationally, in a doubleheader.“Our mindset needs to be to look at these games not as challenges, but as opportunities,” said head coach Ruth Kmak, who knows a thing or two about winning: the Maroons have notched eight 20-win campaigns in her 12-year tenure, and are on pace for another strong season this year.Despite their success, or perhaps because of it, the Maroons are emphasizing “not being satisfied,” according to Kmak.The Titans are 11–2 on the season, and have outscored their opponents 91–17 on the year. 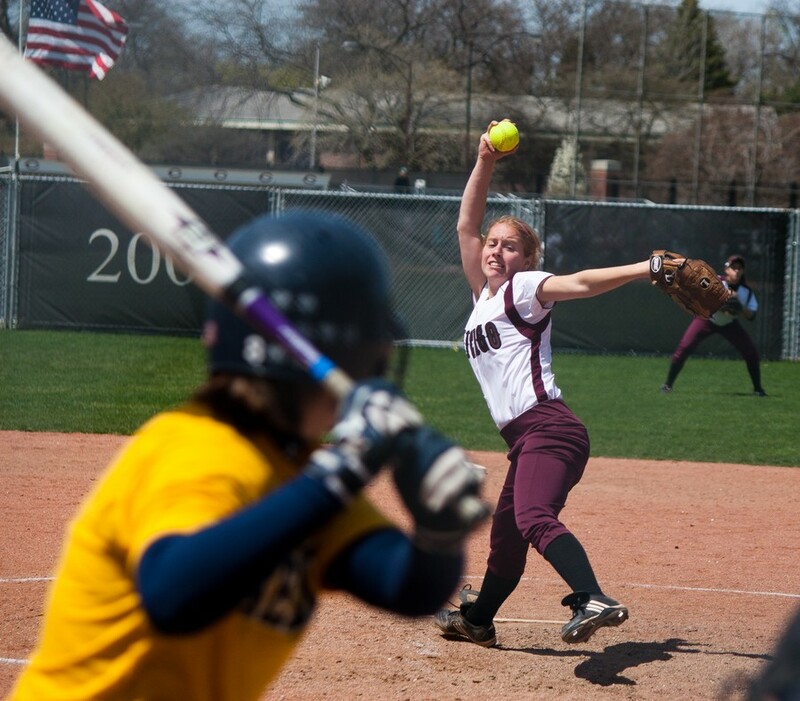 They feature second-year Molly McCready, who boasts a 0.00 ERA: she has only allowed a single unearned run in her 29 innings so far this year.The Maroons aren’t focusing on that matchup just yet, though. Early Saturday, they’ll travel to play against Wheaton (15–5) and Calvin (5–9) in the Wheaton Invitational. Wheaton will be looking to regain their early season form, as they’ve gone 5–5 after winning their first 10 games.Chicago has had no such dip in form, but will still focus on refining its skills.“The key for us is to put all components of the game together (pitching, offense, and defense) each and every game,” Kmak said.The Maroons will be looking to get themselves in the right mindset for their fixtures this weekend.“It is important we refocus and get the wins by playing at our level,” said third-year pitcher Kim Cygan (6–1), who sports a 0.97 ERA over seven starts. “We play best when we are loose and relaxed.”Wheaton features a strong, balanced offense, with six regulars in their lineup batting better than .300, led by senior outfielder Lesley Guenard and her .409 average. The Maroons can expect to face either Ainsle McCullough (7–2) or Danielle Schmidt (8–3), who have held opposing batters to averages of .201 and .220, respectively.Calvin’s offense is not as potent, but the Knights still have threats in the front of their offense. Pitcher Lina Avila has seven home runs on the season, more than the entire Maroons team has had all season. However, Chicago should be able to score its share of runs against Calvin’s relatively average pitching.Of the three teams the Maroons will face this weekend, Illinois Wesleyan represents the biggest challenge offensively. Their lineup, hitting .337 and scoring about 60 percent of their baserunners, is led by freshman outfielder Audra James, who is hitting .522 (12–23) on the season.Maroons can expect a defense up to the challenge, though. “Defensively, after a somewhat rocky start [to the season], we settled in very well and have made some outstanding plays,” Kmak said.As an unaffiliated team, meaning it is not part of a conference, Chicago needs a strong regular season to earn an at-large bid to the NCAA tournament. Illinois Wesleyan is the first of the three nationally ranked teams left on the Maroons’ schedule, and while a split would reinforce that the Maroons can hang with the best of them (besides their two wins over #16 and #23 in the country, they played then-fourth ranked Eastern Connecticut closely, losing 2–0), a pair of away victories would be a substantial boon to their postseason prospects.This weekend’s road trip marks the beginning of a string of eight straight away games, before the Maroons have 12 of their final 14 games at home.